disregarding its shame, and has taken his seat at the right hand of the throne of God. We intended to see the film Coco when it was in movie theatres but just didn't get there. Now we have watched it, thanks to Netflix. What a clever and thought-provoking story, not what I expected from an animated film. 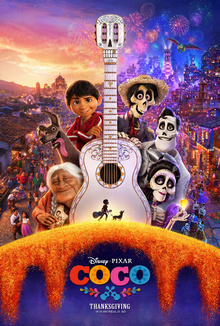 The focal point of Coco is the Day of the Dead, a Mexican tradition which is observed in southern parts of the United States as well. Some years ago I attended a seminar at Ghost Ranch in Northern New Mexico in early November and was startled to see one of the little Day of the Dead altars with its garish colours and skeletal figure. 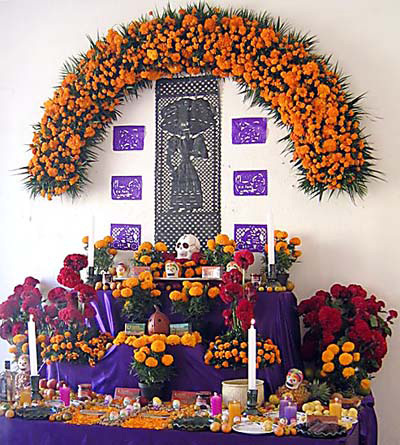 This tradition of remembering and honouring ancestors predated Christianity but became part of the All Souls and All Saints celebrations. It's interesting that a number of cultures around the world have incorporated the veneration of ancestors into their Christian tradition. This is the case in some African cultures, as well as South Korea. It used to be that communities would have cemetery days for a similar purpose, but these seem to be fading as clans become more scattered. In the three congregations I served before retirement we remembered those from our community and other family members who had died during the previous year on the Sunday nearest All Saints Day. We read their names during worship and placed a rose in a vase for each person. It was a meaningful acknowledgment and often folk would attend who might not otherwise be in worship. Perhaps we need to ask how we can revive and deepen these traditions as those who are reminded in scripture of the cloud of witnesses which surrounds us. Did you see Coco? Were you touched by it? Is remembering our forbearers important, both individually and in our Christian communities? Pope Francis hosted oil executives at the Vatican today and I write about it in my Groundling blog. Click here!